Choosing the right headphones can be a daunting task these days, as there are literally hundreds of models in the market place, and it is often quite difficult to choose the right headphones unless you spend many hours reviewing and using them. And that’s why we’re here to help. Our detailed and unbiased product reviews cover the latest models of the top brands. We fully understand that different people have different needs. Some people are looking for gaming headphones, some others for mixing music, and some others just for running. That’s why we have developed different categories covering all types of headphones from professional DJ-ing headphones to stylish headphones for every day use. We have researched and written about the top 10 headphones, as well as the top 10 earphones in the market. These posts will help you find the right headset for you and your requirements. As you would expect, there are cheap and expensive headphones out there.. “What you give is what you get” doesn’t really apply to headphones, as there are many mid-range (neither cheap nor expensive ) headphones of superb quality which easily compete against the very best headphones. We have written some articles which will help you find the top headphones under $30 , and at the same time, we have also written an article about the most expensive headphones in the world! More importantly, we have a section with the latest and best headphone discounts. Do you want them for DJing, running, everyday use or video games. There is a wide array of headphones out there for many different types of uses – from lifestyle to swimming! 3. Pick headphones based on the type of music that you listen to the most. There are headphones with strong bass, which are ideal for hip-hop but not very ideal for classical music.. Our reviews cover the main types of music and can help you to make the right decision. 4. Pick the right brand. There are many headphones brands out there, some of which are great, and some others which are not that great.. As you would expect, BEATS along with the main electronics brands like Philips, Sony, Panasonic and Bose have all developed some high-quality headphones. However, there are some other less popular brands (to non-music professionals) like AUDIO TECHNICA, AKG, V-MODA, SENNHEISER, BLUEDIO and SMS AUDIO which specialize in headphones and professional music products, which have produced some truly outstanding headphones! Our reviews are focused on all quality brands, making sure that all the very best headphones are reviewed and recommended. To help you choose the right headphones that suits your needs, all our product reviews include ratings based on: 1) DESIGN and STYLE 2) SOUND 3) COMFORT and 4) VALUE FOR MONEY. 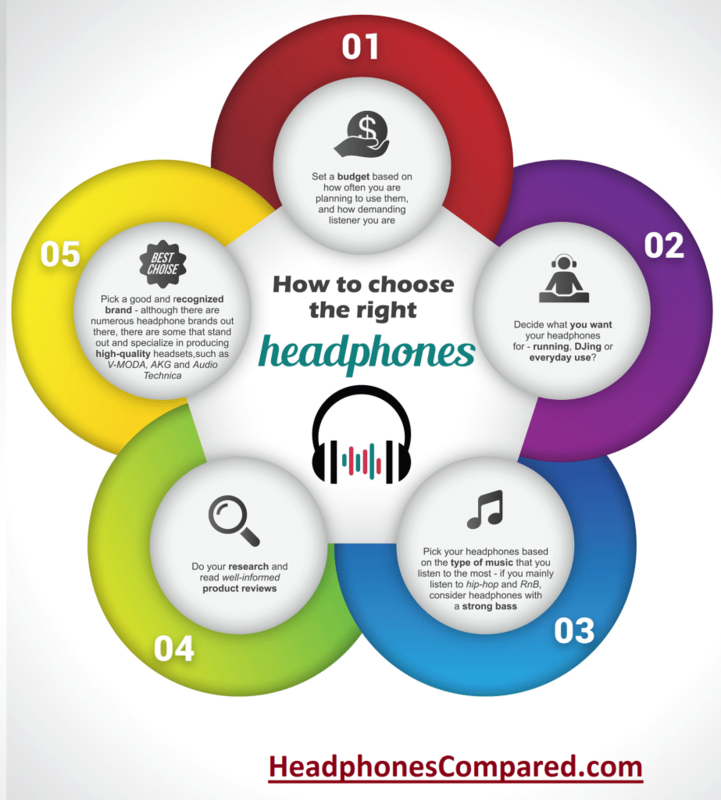 A Comparison Chart for 2014 is also provided along with rankings across the main headphone categories which incorporate: The Best Headphones for Running, The Top Wireless Headphones, The Best Bluetooth Headphones and a general ranking with the Best and Most Recommended Headphones for 2015. Last but not least, having taken into account more than 100,000 customer reviews, we have produced rankings for all the main and best headphone brands. Thanks for outlining these factors. I am having a hard time choosing the best headphones for me, and currently I am stuck between two pairs in particular. The first being one that you’ve highly recommended in your posts the V-MODA XS and the other are the Audio Technicas M50X. Which do you think would be best for someone who wants great sound quality, but also wants to be able to walk around with them and not look daft. Well, your site certainly caters for the 4th section of the pentagon! I’ve been looking at your reviews for Beats and a couple of other brands of headphones, and I’m really thankful for the depth of information that you give. You’ve made my decision much easier. However, with my budget $150 are there any pairs that can really provide ample sound, design and portability? I’m still struggling to see my perfect pair. Hi Viola. We are grateful for your kind words. If you can’t make up your mind, just look at the Top 10 list – https://headphonescompared.com/top-10-headphones – there are quite a few headsets within your price range, which meet all your criteria. From my experience, when buying headphones it’s usually better to go for brands that are less mainstream, simply because you generally get a better bang for your buck. I’ve had multiple pairs of Beats in the past, which have been good in terms of quality of the build and sound, however they are outrageously expensive. More of a fashion statement than anything in my opinion.